This Coupon is a 15% discount off a minimum purchase of $25, valid from 7:00 AM PT on June 29, 2018 until 9:00 PM PT on June 29, 2018. The Coupon discount is capped at a maximum value of $100. Discount applies to the purchase price (excluding shipping, handling, and taxes) of eligible items on eBay.​com, cafr.ebay.​ca and ebay.​ca. *Eligible items exclude warranties and protection plans, as well as items from the Coins & Paper Money, Gift Cards & Coupons, and Real Estate categories. 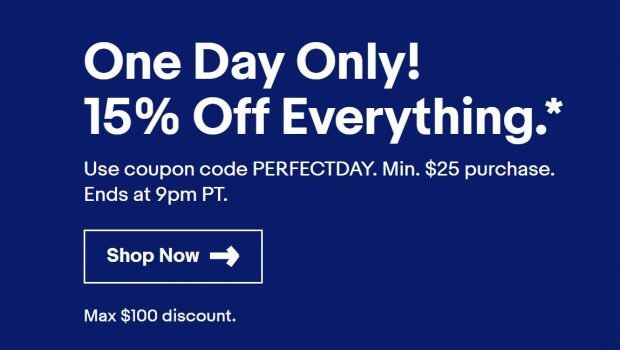 Today Only – 20% Off eBay Coupon for All Sony Gears ! Previous Previous post: Sony FE 400mm f/2.8 GM OSS Lens now Available for Pre-order !